Is your lab still preparing microorganism suspensions the old fashioned way for Growth Promotion Testing of culture media? 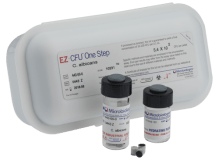 Allow us to introduce you to your new favorite lab supply, EZ-CFU One Step. We designed this product specifically for Growth Promotion Testing, Suitability of Tests for Specified Microorganisms, Suitability of Counting Methods and more. These ready-to-use quantitative microorganisms are just 3 passages from the reference culture and deliver 10-100 CFU per inoculum, as required by the Pharmacopeias, with minimal prep time.